Disaster in the US Dollar! Profit bonanza in ETFs! The dollar is being driven lower by some of the most persistent flood tides in history — America's $800 billion trade deficit, Asia's persistently rapid growth, Europe's surprisingly strong revival, Latin America's remarkable leap onto the world scene. Years ago, if we suffered a dollar decline of this breadth and depth, policymakers in Washington could quickly come to its rescue. They could dig into a rich stash of foreign reserves. They could consistently buy up dollars in foreign exchange markets. And they could make a solid effort to support its value. But now, that option is virtually out of the question. America's reserves are too slim; its foreign debts, too large. The U.S. Treasury Department simply cannot afford it. Not long ago, the Federal Reserve could raise U.S. interest rates … pay higher yields to international investors … attract more money to U.S. dollars … and support the currency that way. But now, higher interest rates are also unthinkable. The U.S. housing market is too shaky; the mortgage market, too leveraged. And as you'll probably hear between the lines in Chairman Bernanke's testimony before Congress this week, the Fed simply cannot risk sabotaging these already-troubled markets. It would be the last nail in their coffin. So the dollar continues to fall, while foreign currencies continue to soar. When your stocks or bonds fall in value, you see the losses in black and white — right in your brokerage statement. But when your dollars fall in value, you may not feel the symptoms — until long after the fact. 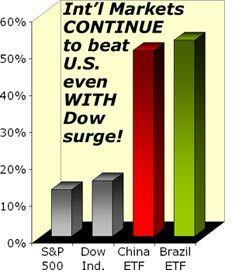 Lagging U.S. stocks: Although the Dow is rising, foreign stocks are leaving it in the dust. A key reason: Many international investors are bypassing stocks denominated in sinking U.S. dollars and pouring most of their money into stocks with stronger currencies — in Canada, Australia, New Zealand, Brazil, Europe, and, of course, Asia. Sinking bonds: U.S. stocks are up. But U.S. bonds are down. So if you own U.S. Treasury bonds, you're already witnessing a steady deterioration in your portfolio. And if you own high-yielding U.S. mortgage bonds — just downgraded en masse last week — your portfolio is being gutted. A key reason for the decline: The world's biggest owners of U.S. bonds are not American residents. They're in Japan, China or Germany. And every time the dollar falls, those investors lose money. So even without a mortgage scare, they have every motive to flee U.S. bonds and shift to bonds in rising currencies. Shrinking purchasing power: If you live in the United States, most of what you buy with your dollars is either imported or has imported components. So as foreign currencies surge, the price you pay for foreign goods must go up accordingly, eroding the purchasing power of your money. Last year, for example, the United States imported $217 billion worth of crude oil, a whopping six times more than the total value of imported computers, flooding into the U.S. by the millions. And just this past Friday, the price of crude oil exploded again, thanks to the many factors I told you about last week … but also due, in large measure, to the sinking dollar. Gas prices at the pump are likely to jump as well. But that's just the beginning. Because of the surging cost of the euro and other foreign currencies, price hikes on thousands of other imported goods are already in the pipeline. So when you get your monthly statement from your broker, don't forget to factor in this undeniable reality: No matter how you slice it, your dollars will buy less. Most Everyone Who's Invested In Foreign Markets Has Made Out Like a Bandit! Let's say that, four months ago, you had $10,000 to invest. And let's say you decided to put it in an index fund that tracks the Dow Jones Industrials. Your gain through Friday's close: About $1,540. Not too bad for four months' work. But now let's say that you invested that same $10,000 in one of our favorite country ETFs — the iShares MSCI Brazil Fund. Big difference! Your gain through Friday's close would be $5,970, or nearly four times better — also in just four months. One of the key reasons: Brazil's money is now among the strongest in the world. America's is among the weakest. Example #1: On January 1, you buy a U.S. stock. By the end of the year, it goes up 10%, while the purchasing power of your money slips by 5%. Your result: A net gain, after inflation, of only 5% . Not very good. Instead, let's say you invested in a euro-denominated stock that also goes up 10%, while the value of the euro rises 10%. Your result: A total gain of 20%, which even after inflation, leaves you with a net gain of 15% . That's three times more than your 5% net gain on the U.S. stock. Example #2. Because the European economy is growing more quickly … because European companies are making more profits … and because European markets are getting a bigger share of international investment flows … your European stock goes up 20%. Your result: A 20% gain in the stock plus a 10% gain in the currency minus the 5% inflation equals 25% , five times more than the net gain on your U.S. stock. Example #3. Brazil's market is rising even more quickly than Europe's. It's experiencing a more rapid increase in the influx of foreign money. It's enjoying an even bigger surge in the value of its currency. So in this example, it's not unreasonable to assume a 40% rise in your stock, plus a 15% rise in the currency. Your result: 40% + 15% − 5% = 50% , or ten times more than your net gain on the U.S. stock. Sound unreasonable? Then remember: These examples are for a full year. And just in the past four months , the Brazil ETF, which factors in both the stock and currency appreciation in one package, is already up 59.7% . No matter where you invest, of course, you also have to consider the risk of loss. But many foreign companies are also paying higher dividends — a nice cushion in down markets. Think The Dollar Decline Will End Soon? Think Again. The U.S. trade deficit, long ignored in Washington and much pooh-poohed on Wall Street, is out of control. It's closing in on $800 billion! This means foreign exporters are raking in huge amounts of excess U.S. dollars they have to sell, inexorably driving the dollar's value down. This dollar decline is then supposed to make American goods more competitive and eventually help shrink the U.S. trade deficit. In practice, it just so happens that the two countries with which we have the largest single trade deficits — China and Japan — also happen to have the currencies which have risen the least against the dollar. Ironic, isn't it? Here we are, suffering all the hits from a falling dollar … but reaping none of the purported benefits! China is the leader: Despite the dollar slide … despite the recent scares about Chinese goods … and despite all the brouhaha in Washington, China's trade surplus with the United States (the U.S. trade deficit with China) continues to grow by leaps and bounds. Fact #1. Last year, China's surplus with the U.S. was $232.6 billion. Fact #2. So far this year, just in the first five months, it's $96.3 billion, up 17% from the equivalent period last year. Fact #3. Unless there's a radical change in direction, China's surplus for the full year will grow by roughly 17% as well. So do the math: $232.6 billion x 1.17 = over $270 billion! 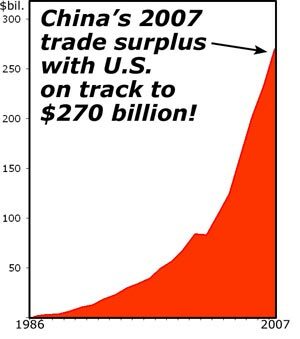 Just 20 years ago, China's surplus with the U.S. was $2.8 billion, and that was thought to be huge. Now, China's surplus is close to one hundred times larger. Japan's trade surplus with the U.S., large and growing for many years, had previously been the main source of concern and controversy. Today, China's surplus is nearly three times larger than Japan's. Fact #4. China and Japan are not the only countries that have large and growing trade surpluses with the United States. As you can see from the long list to the right, based on the latest January-May data released last week, there are now 102 countries that have trade surpluses with the United States! Our closest trading partners, Canada and Mexico , have surpluses of $27.9 billion and $27.5 billion, just in the first five months of the year. And last year, their surpluses (America'sdeficits) were $72.8 billion and $74.1 billion, respectively. Not exactly petty change. The world's third largest economy, Germany , had a surplus of $18 billion so far this year, after $47.8 billion last year. Nigeria and Venezuela , despite their unstable governments, chalked up huge surpluses due to their large oil exports to the United States. Which country would you guess has the next largest surplus with the U.S.? Huge economies like Britain and France? No. It's Ireland — with an impressive $9.2 billion U.S. surplus so far this year and $20.1 billion in 2006. Bangladesh, Nicaragua, Botswana, Swaziland, Malawi, even Zimbabwe with all its turmoil — even the small French outpost in Antarctica — have reported surpluses with the United States in the first five months of 2007! This just goes to illustrate the depth and breadth of the primary problem driving the dollar lower against scores of world currencies — the out-of-control U.S. trade deficits. No more shareholder-busting executive bonuses. Smaller and more innovative, fuel-efficient, cars dominating the nation's highways. Foreign stock ETFs. We've been recommending Brazil's (EWZ), China's (FXI), Hong Kong's (EWH), and others to our subscribers. All have done exceptionally well. Foreign real estate. While U.S. real estate is sinking, choice properties in key regions of the world are appreciating virtually nonstop. 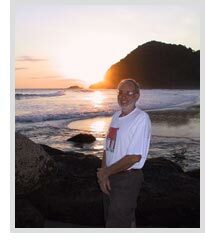 A couple of years ago, for example, Elisabeth and I bought a condo on a largely undiscovered, quiet little beach between two rising cliffs in southern Brazil. Even though it's just a short drive from the São Paulo's bustling metropolis, it cost us a pittance. And now, just with the appreciation in Brazil's currency, it's already up nearly 30%. These are the kind of opportunities that abound beyond our shores. And this is just one of the reasons I made such a major effort this past week to reach out to you — with my first-ever online video briefing. The response from viewers has been absolutely wonderful, and I am humbled by the outpouring of glowing comments. Step 1. Turn on your computer speakers. Step 3. You will come to a screen like the one to the right. Step 4. 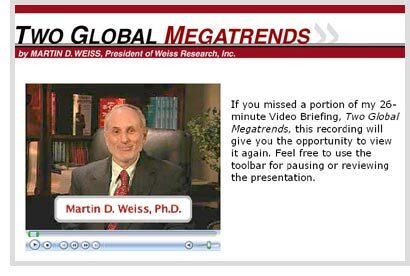 Then, just use the handy toolbar to pause or review the presentation as you wish. That's it! No registration needed!